Your roof is the first line of defence, protecting your home and contents from the elements year after year. There are steps you can take in maintaining your home which will save you money in the long term. Roof problems can very quickly escalate causing a lot of damage to your property and belongings if your roof isn’t properly maintained. In the UK the most popular roofing materials are slate and cement tiles. The expansion and contraction with the changing temperatures of the seasons can soon dislodge, crack tiles and slates, or cause them to slip out of position. Animal, birds and wildlife can often cause damage to cement work, chimneys, ridges etc. which can cause tiles and slates to slip. Additionally, nearby trees, if left to grow unchecked can not only start to undermine your foundations, but can also grow too close to your property. Regular maintenance and crown reductions (MLTC Tree Care are highly respected arboricultural contractors) will effectively control the growth of your trees, limiting any potential damage they might cause to your buildings. Just one slipped tile can allow enough wind into your roof space to blow the entire roof into the street. 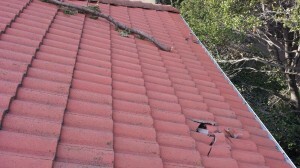 A seemingly small area of damage can quickly cost you your whole roof. Regular roof inspections and a little maintenance can save the expense of large repair bills maintaining your home in the longer term. Maintaining your home & roof will protect the value of your property and your investment. A stitch in time quite often saves nine later on, so get your roof checked by Roofing Contractors and sleep safe and sound this winter. Regular annual inspections of your roof will give you the protection your property needs and prepare you for the winter months.